Today's schedule began with viola repertoire class. Is there any way to better start your day than with the C string? The students were divided into two classes .. Books 1-3, and Books 4+. I spent the morning shuttling back and forth between the two rooms. Each group was taught by one Japanese teacher and one Australian. The main points focused on throughout the morning were tone, Cing sound/posture, ensemble and balance. One of the Japanese teachers used an exercise she learned from wind surfing to talk about "tanden" or the center of balance. After the morning classes, I met up with some teachers from California and Colorado for lunch on the plaza. 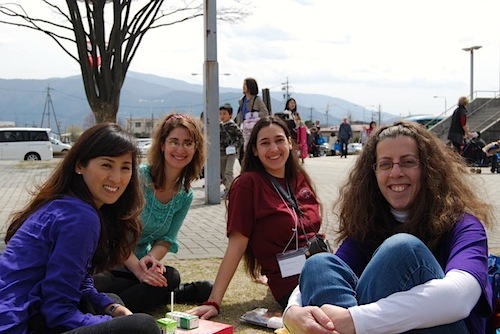 We all had our Japanese box lunches, surrounded by other participants. 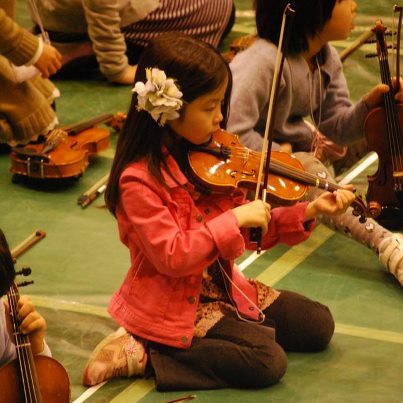 After lunch, I went to e violin group lesson in the gym. More like a mob lesson ... hundredss of children from Books 1-7. Three teachers took turns leading the group .. One from Japan, one from Belgium and Nicolas Kendall from the US. Pieces ranged from Twinkle - Eccles, the teachers picking one main point and using games and exercises to enhance the technique. Nicolas, especially, got the children laughing and excited. There is no way to find sufficient words to describe the awesomeness of that sound and the energy in the room. Later that afternoon we went to hear teacher presentations. First was Cathy Lee giving a talk on bowing techniques, and how to make them easier and physically efficient. We then hurried across town to hear William Preucil speak on Viola Book 8 and aspects of viola tone. My favorite remarks of his were "Music is what happens in between the notes." and "Tone is not in the viola, it comes from inside you." There are so many activities and events going on throughout the day that its very hard to choose what to see. But, no matter what we choose, we have a mind-blowing experience.